Have you ever been so affected by a book it sticks with you for days after you’ve read the last page? Dreamlander by K.M. Weiland had that effect on me. Have you ever wakened from a dream that seemed so real it felt as if you were really there? The residue of it stays with you? The memory of it keeps recurring? Have you ever wondered which is more real – where you are or where you were in your dream? Chris Redston’s recurring dream was sure to kill him if he didn’t hurry and wake up! Who was that woman warning him to not cross the worlds? Why was she so desperately trying to convince him to not come over? What a ridiculous dream! He felt as if he were losing his mind. Then he discovered the note taped to his window, the note warning him about his dreams; but he had told no one about them! This story grabbed my interest from its very beginning and did not, would not, let me go. It’s filled with suspense, action, drama, believable emotion of the characters, danger, hope, battles, and so much more. The main character has to deal with his dysfunctional father’s problems by day and then at night … those crazy dreams. Then things get really complicated for him when he learns he is a Gifted who holds the balance of both worlds in his hands. He is drawn into the battle between good and evil – and the reader is taken on a fantastical journey. K.M. Weiland created a parallel world with such detail and believability the reader is challenged to consider the possibilities. To say Dreamlander is a good read is an understatement. If any reader can set aside the tangible and get hold of the visuals presented by K.M. Weiland, there is an amazing adventure waiting to be enjoyed. 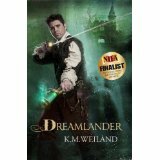 Dreamlander by K. M. Weiland is a BRAG Medallion winner and was a finalist for the 2014 National Indie Excellence Award in the Writing and Publishing category. You can find Dreamlander listed on my Buy The Book! page. This entry was posted in Mostly About Reading, Reviews & Interviews and tagged BRAG Medallion winner, Dreamlander, dreams, epic fantasy, fantasy, fiction, K.M.Weiland, National Indie Excellence Award, parallel worlds. Bookmark the permalink. What a fantastic review! Thank you so much, Lynn. I’m just tickled pink you enjoyed the book so much.